Just like the red lipstick, red dresses are the perfect match for any season. They are attractive, daring and bold. This week I will explain why red is the color for the autumn season! As you have already guessed, I am wearing red for this week’s look. Red outfits are healthy, warm and vibrant, and they show that your fashion’s heart beats strong and sure! As seen in the latest trends, the colour is once again within the top picks – from bright red to burgundy, basically all variations of red are super trendy. The fabrics of course vary, but the preferred once for long dresses are still silk and chiffon. You can find a lot of different variations in the shops, but if you are to buy your own silk fabric Tissura certainly has the best quality and colour variety you can find in a single online shop. Red is popular in all of its shades this season, but if you would like to break up the bold red look, you can always go for an outfit with even bolder prints. Or as in my case an imitation of animal print. 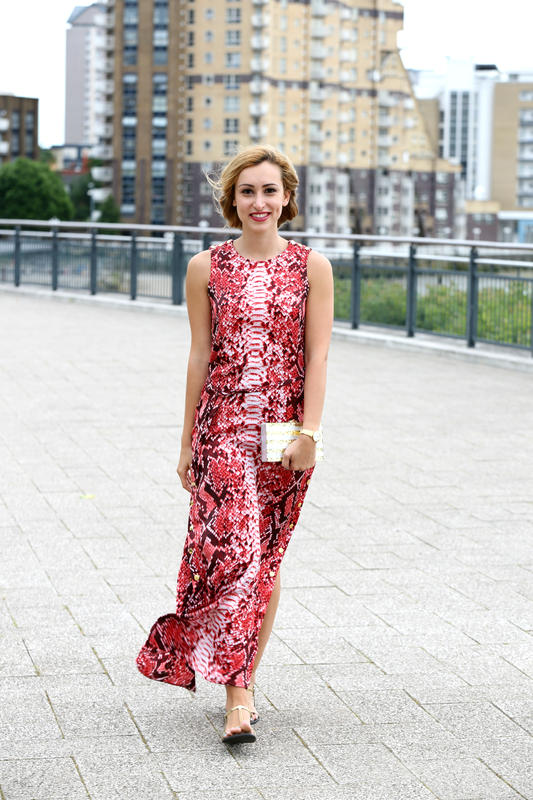 This week, I went for a bold combination of red and imitation of snakeskin print. This is a very daring red print but at the same time super chic, stylish and intriguing. The gold buttons at the sides give you the opportunity to open up the ends of the dress and create a bit more movement. They are also a very original detail. What I love about this Michael Kors dress is also its length. It is easily adaptable to heels and flats. Even if you wear it with flats it still looks super elegant, as it falls right till the end of your shoe sole. If worn with a pair of heels though, you can see the entire beauty of the shoes, as the dress does not fully cover them. The beauty of red is that it comes in all kinds of different shades to suit whatever your skin tone and mood is. Head-to-toe burgundy looks are the thing right now, especially in the form of thick knits and leather! Red suede is also extremely popular this season, coming in the shape of all you can imagine – coats, trousers, shirts and dresses. As suede is quite a thick material, it is better to opt for a dress with a waist tie if you’re curvy, so your figure won’t get drowned out.